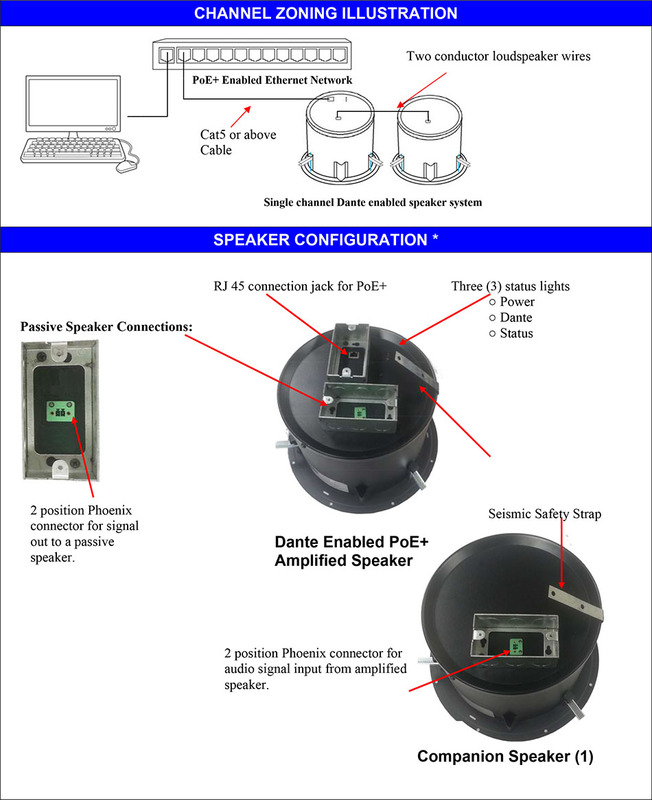 The AMK DS82-A loudspeaker assembly is powered by a POE+ network amplifier with Dante™ input. No external power supply is required. The speaker includes a Class D amplifier which provides efficient use of power. The assembly comes with AMK's CX 802, highly efficient 8" coaxial loudspeaker. This system will solve the issue of having to provide a separate amplifier or I/O interface for speaker installations. One PoE amplified speaker can power a total of (2) speakers, one active and one passive speaker. This assembly can be used in wide range of projects for paging and background music applications. The DS82-A is ideal for hotels, education, hospitals, retail stores, performing art centers, restaurants, airports, houses of worship, and board rooms. Copyright 2017. AMK Innovations, Inc. All Rights Reserved.